Last month, I outlined my list of 500 tasks to do throughout the year, essentially keeping track of recurring tasks that will keep things around the house functional, clean, and clutter free. 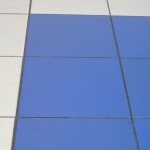 One of the things I added was a regular ‘deep cleaning’ of the bathroom tile and grout. Both of the bathrooms upstairs are white on white: White tile with white grout. It’s simple and can be a very clean look, well, if it’s clean. Which it really hasn’t been. We use a steam mop every time we clean the house, which actually works great on the tile itself, but it does nothing for the tile. 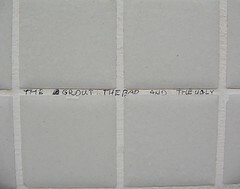 From everyday use, the grout has gotten progressively darker in both of the bathrooms, and started to look pretty dingy. It was even worse in the shower stall of our bathroom. I’ve always been a pretty big fan of eHow, so I was happy to find a solution that involved using Oxi Clean as a solution. Oxi Clean has always worked well as an addition for laundry, but I always knew it probably had more uses. The article essentially suggested that you make a paste out of it, combining two and a half scoops of Oxi Clean with two cups of water. I ended up adding more Oxi Clean as I found that it wasn’t really a paste, but just thickened water. In the future, I might have to experiment with the ratios. Following the instructions, I applied it to the grout. You don’t really scrub it in, you just apply it and leave it sit for awhile to let it work itself in. 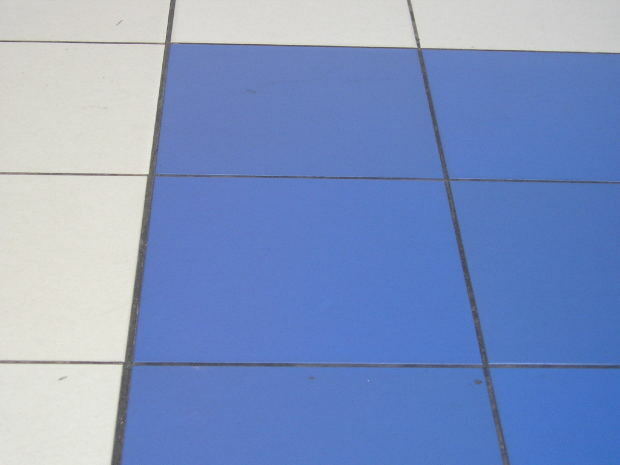 I used a rag to apply it to the tile, and went off to do some other stuff, returning about 45 minutes later. By that point, some of it had dried, but that was OK. I came with hot water and a cleaning brush and set to work scrubbing. I could instantly tell that it was working. I scrubbed all the areas that I had done, then I emptied the bucket, re-filled it, and got a fresh rag. I wiped it off a few times, because the article stresses that you really don’t want to leave Oxi Clean residue around, so make sure it’s completely off. Once that was done, I went back over the whole floor with the steam mop. I only did about 1/3 of the floor and one of the three walls in the shower, simply for the reason that you have to leave yourself an area to work (and I could have done all three walls in the shower, but I was getting tired plus I wanted to see if it actually would work). Right now, it looks a little strange in our bathroom because you can definitely tell the difference between where I did it and where I haven’t, but seeing it will give me extra motivation to finish up the remaining areas. As I said before, I’m excited to see what other uses we can find from Oxi Clean. It’s been a staple in our house for years, but I have a feeling that cleaning the tile grout is just one of the many uses that we will hopefully discover.